Minessence Values Framework [MVF] Knowledge-Base: If I don't have any values in one or more of the clusters does it matter? Is there something wrong? If I don't have any values in one or more of the clusters does it matter? Is there something wrong? To take an actual example, the person below on receiving their Values Map asks, "I have no values in the security cluster. Does this mean I am insecure?" The reverse is true. 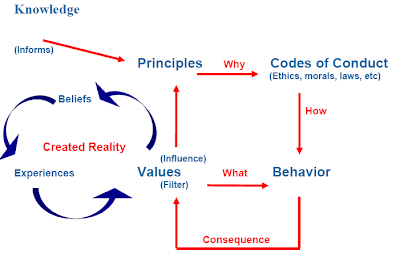 The Values Map is a chart of value priorities. If you don't place a priority on a particular values such as security, that simply means you don't have the need to. If on the other hand you were feeling very insecure for some reason, then security would be playing on your mind and you would choose security as a priority. Another common question is, "I've looked through all my AVI Reports and there's no self-worth. Does this mean I have no self-worth?" Once again, the reverse is actually true. If self-worth issues were playing on your mind you would choose statements related to it when completing the AVI. When matters of self-worth are not playing on your mind, you will choose statements related to other values with the result that self-worth, along with many other values, will appear with a priority of zero on all AVI Reports. This brings out an important aspect of the AVI and its reports. The AVI is designed to elicit priority values from our unconscious. There is a difference between a value being important to us and a value currently being a priority in our life. For example, returning to security. The person who asked the question about their zero score on security probably considered security as something that is very important value in people's lives, it just isn't currently a priority in their life. So it is with all values, we can believe a value to be important in people's lives, however, if it is not currently important in your life it will not show up in your AVI Reports. Many values will be important in your life, only some will be a priority--the AVI is designed to identify those which are currently a priority.